If you release the club too early on the downswing, this simply means that you are creating a straight line relationship between your left arm and the club shaft (for right handed golfers) before you are at impact with the golf ball. Better golfers keep the angle that they create between the golf club and their left arm until just before impact and they do not create a straight line between the club shaft and the ball until impact with the ball or just following impact. To help you correct an early release, try the following drills. Place a wood cover on the target line of the ball but opposite your right foot. Hold the club head up off the ground so that as you swing the club back you avoid moving the head cover. Now swing down and work on striking the ground to the left of the wood cover. Listen to hear the connection between the club head and the ground but without touching the wood cover. If you release the club too early and create a straight line between your left arm and the club shaft before you get to the wood cover, the club head will hit the wood cover and provide you with the information that you require to show you have released the club too early. Do this drill slowly at first, learning how to pull the club downwards, whilst keeping your thumbs pointing upwards, until the club head can clear the head cover on the floor and strike the ground where the ball would be. Once you can achieve this slowly, begin to speed the movement up but still work on striking the ground to the left of the head cover. Once you feel more confident doing this at speed, introduce the ball and see if you can strike the ball without hitting the head cover. Another great drill to help create an early release would be to place an alignment pole through the holes in your range basket so that it is two to three inches from the floor. Place this pole across your target line, two inches in front of the ball. 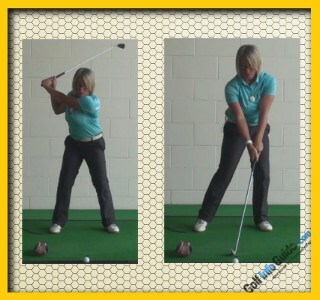 Make a swing at where the golf ball would be and work on hitting underneath the alignment pole. If you release early and create a straight line between your left arm and the club shaft before you strike the ball, the club head will be at it's lowest point to the right of the golf ball as you look at it so you will then swing up towards the ball and over the alignment pole. If you release the club correctly and make the straight line between your left arm and the club shaft as you hit the ball or just after impact, the lowest point for the club head will be just after impact so your club head will travel under the alignment pole and the shaft of the club will knock the pole away. Work on these two drills to correct an early release and you will improve your golf swing and create longer, straighter and more consistent golf shots.